Schematic of monolithic QD laser on Si. Silicon (Si) photonics is one of the most buoyant technologies in the world today and is set to revolutionize optical communications and interconnects. However, the lack of a practical Si-based laser has become a severe limitation. This is because that Si is an inefficient emitter. Much effort has been directed toward monolithic integration of III-V lasers with Si with a view to achieving low-cost, large-scale integration of photonics circuits. Recently, monolithic integration of III-V lasers on Si has shown substantial advances by utilizing self-assembled quantum dots (QDs) as the active region. Their unique properties, in particular, the enhanced tolerance to defects, have allowed rapid development in 1.3 μm III-V QD lasers grown directly on Si substrates, including low threshold current, high output power, high operation temperature, and extremely long lifetime. Other than that, the relative intensity noise (RIN), is the key figure of merit to investigate the laser performance in fibre-optic communication networks, since the RIN leads to a limited signal-to-noise ratio (SNR), and thus an increased bit-error rate (BER) restricts the data transmission rate and distance. Unfortunately, monolithic III-V QD laser on Si with a low RIN level has not yet been reported. Very recently, researchers from Prof Huiyun Liu's MBE Group of University College London (UCL) have demonstrated a high-performance and low-noise electrically pumped continuous-wave (CW) 1.3 μm single transverse mode InAs/GaAs QD lasers grown directly on Si with threshold current as low as 12.5 mA at room temperature (RT), a maximum lasing operation temperature up to 90°C, and an ultra-low RIN measured to be in the level between -150 and -160 dB/Hz. Attributing to this low RIN feature, 25.6 Gb/s data transmission supporting standard 100 Gb/s solution over 13.5 km single mode fibre has been demonstrated by this Si-based QD laser. 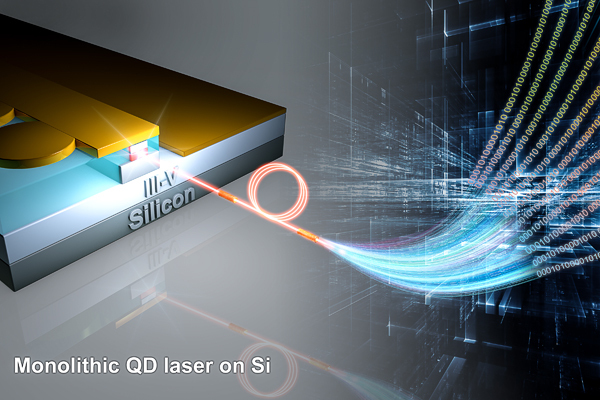 The experimental results indicate that the monolithically integrated InAs/GaAs QD laser on Si is suitable for future low-cost data transmission in hyper/inter-data centres and metropolitan data links. Related results are published in Photonics Research, Vol. 6, Issue 11, 2018 (M. Liao et al., Low-Noise 1.3 µm InAs/GaAs Quantum Dot Laser Monolithically Grown on Silicon). Dr Siming Chen, Royal Academy of Engineering Research Fellow hosted by UCL, the principal investigator of this project, believes that this work has significance for high-performance practical on-chip Si-based laser. The further work will focus on the integration of on-chip lasers with other Si-based photonic components, both actively and passively, to develop end-to-end Si photonics integrated photonics circuits by the monolithic method.